Getting braces is a confusing time for kids and parents. 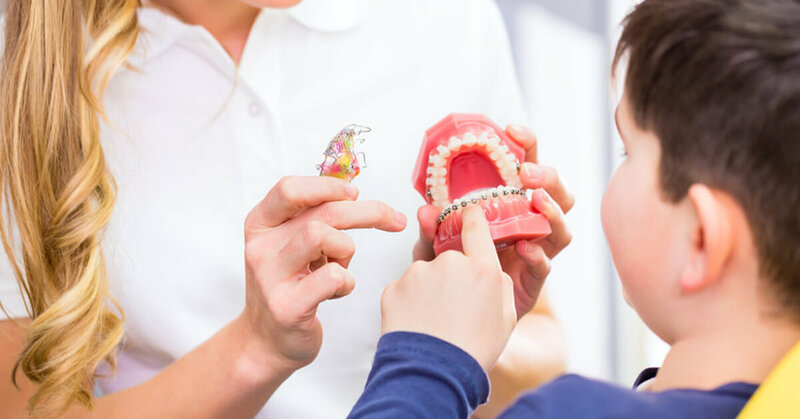 Find out more about the best option for your children’s orthodontist here. Orthodontists are dentists who have specialized in the alignment of the teeth. This dental specialty aims to prevent and treat facial and dental arch crowding. Misaligned teeth or a ‘bad bite’ is deemed a malocclusion. When children have a bad bite, a children’s orthodontist will assess this. They will diagnose and plan to straighten your kid’s teeth and jaw. The standard recommendation is to see an orthodontist when a child is seven years old. This is as your child is entering key growth phases. Early intervention before this stage can correct jaw and tooth problems. Many dentists and orthodontists are now expanding their diagnosis much earlier than seven, this is an important progression in understanding crooked teeth. If your child needs braces for their teeth, this article will cover some options available. Many parents wonder about the average cost of braces, braces before and after, the types of braces and other important facts. What does a children’s orthodontist do? A children’s orthodontist will correct any misalignment in your kids’ teeth and jaw. If these problems are left unchecked, they can have negative effects. These can include breathing, sleep health, speech impediments, poor oral hygiene, and problems chewing food. Over-crowded teeth – If your kid’s teeth are over-crowded, this can prevent their adult teeth from coming in properly. An orthodontist can realign his or her teeth. The main reason for crowded teeth is an underdeveloped jaw. It’s important that this is addressed. Bite and jaw alignment – This complicated term refers simply to over bites, cross bites or under bites. These deviations can cause chewing and speaking problems. It is key that they are diagnosed at a young age. Traumatic bite – A child’s bite can affect the overall look and feel of your child’s face. If their teeth are misaligned, it can cause a bite that causes damage to teeth. The children’s orthodontist aligns their teeth and remove a traumatic bite. More importantly, they should correct jaw growth factors. Missing and incorrectly erupting teeth – If your child has congenitally missing teeth, an orthodontist can help. They can also help to correct teeth that are not erupting in the correct way. Ankylosed teeth – In this condition, your child’s tooth does not erupt. It is hidden under the gum and bone. These cases can cause the permanent tooth displacement. This needs to be dealt with as soon as possible. The children’s orthodontist will take a full examination. These include x-rays and models (bite impressions) to determine the best option. Once they have assessed the problem, they can create a treatment plan. When it comes to correcting some orthodontic issues, the earlier the better. Taking your child to see an orthodontist will help assess the health of their teeth and jaws. Effective treatment will prevent further problems as they grow up. A children’s orthodontist is able to control where your kids’ permanent teeth come in. They can address and chance the structure of the jaw and teeth in a beneficial way. By the age of seven, your child’s jaw has developed enough for the orthodontist to assess it. This is a good time to make an initial appointment. Many children’s orthodontic assessments can now happen much earlier. The permanent teeth will develop in a sound way. Bad habits (such as tongue pushing, teeth grinding and thumb sucking) can be corrected. Bite problems (like an open bite, deep bite or cross bite) can be addressed. The growth of the jaw can be guided to accommodate all teeth. You can help improve your child’s appearance. Lower the risk of problems or damage to protruding teeth. Increase the function of the teeth, lips and face. Prevent more invasive treatments later in life. Improve their oral hygiene and prevent cavities. Improve your child’s self-esteem and confidence. Even if you don’t think that your kid needs any orthodontic treatment or braces, it is a good idea to make an appointment. Some alignment problems may be difficult to see. It also allows your child to become comfortable with the office and process. If future treatment is needed, they will be familiar and relaxed. If your kid’s orthodontist recommends braces, it can be a two phase treatment. The first phase will occur when your child still has their baby teeth. The second phase can happen when your child is a little bit older. This age will be chosen by the orthodontist. It will be based on your kid’s specific needs. Correct poor oral habits that have already formed. Correct breathing, sleep and tongue function. Help with correct biting and chewing. Correct a problem that is developing. Support and guide jaw bone growth. These bones support the teeth. They enable the teeth to grown in straight and in a healthy manner. Prevent damage to any protruding front teeth. Align teeth into their correct position. Help with creating an attractive face. Help provide a foundation for a healthy adulthood. Further, improve appearance and tooth function. There are a few main types of teeth braces that orthodontists use. Your child will likely be assigned one of the following. Braces – Teeth braces use brackets and an arch wire to align the teeth. This can be referred to as ‘training’ the teeth. The brackets are attached to each tooth. The arch wire connects each bracket. Over time, the orthodontist will adjust the arch wire. This will gently train your kid’s teeth. Dental braces are often made from metal, but ceramic and clear materials are also possible. Headgear – Head gear are used to correct a jaw development problem. These problems include over bites and under bites. Your child might have headgear alone, or in tandem with teeth braces. If the latter is the case, the orthodontist will fit the headgear to attach to braces. This will help the teeth and jaw align. Retainers – After the work of the braces is done, some orthodontists use appliances to keep teeth in line. The retainer will prevent the teeth from reverting to their original state. Retainers are often worn at night, and the work is done while your kid sleeps. They will be worn until adulthood. These means that the jaw bones have grown into the correct position. Options aside from clunky metal braces are now available. Kid’s braces come in many styles. Your kids may not have to undergo traditional metal braces. Some are very discreet, and they are improving all the time. A really popular style of braces is clear aligners or clear braces. These are a removable plastic teeth brace or guard. They straighten the teeth while being hard to detect to the plain eye. Clear aligners are only suitable for certain situations. Typically, they can be used when there is minor alignment required. Your kid can take the clear braces out for up to 4 hours a day. This is helpful when they want to eat difficult foods. They can also take it out to brush their teeth normally. They must wear their clear aligners brace for at least 20 hours per day. They will sleep with it in. It is discreet and effective. That said, this system does cost more than traditional metal braces. Many types of insurance will not cover clear aligners. When it comes to the average cost of braces, it is hard to select a figure. The amount of money that kid’s braces cost will depend on many factors. These include your child’s age, the kind of problem he or she has, and the specific type of braces needed. All of these factors impact the cost of treatment. That said, the average cost of braces can be estimated based on the past and current patients. The most common type of braces are made from metal. In 2014, cost of braces varied between $3,000 to $7,500 USD for patients without insurance. If you have dental insurance, it might pay for part of this cost. Different plans have different inclusions. It’s important to check your healthcare policy to check your coverage for the orthodontist. Different kinds of braces can cost a lot more. Removable appliances or clear braces (examples include Damon or Invisalign) can cost up to 50% more than metal braces. Insurance does not normally cover these extra expenses. Does your kid need braces? Are you concerned about their over-all dental health? Maybe you just want to ensure that they get the best start in life and have a healthy adult smile. It is a good idea to get them started at a young age. Find an orthodontist that assesses children early in their development. Did you know that crooked teeth are a nutritional problem? Join our mailing list for more important info that can help your kid’s dental health. You can also get started to change your kid’s dental health with my free EBook – 4 Quick Dietary Steps For Stronger Teeth. Any recommendations for orthodontists? Also would you recommend a functional dentist instead of a orthodontist for fixing teeth? Check Dr Barry Raphael (www.dralignme.com) out in New Jersey, he also trains orthodontists and dentists and is excellent at childhood growth based cases. Any recommendations in Vancouver, British Columbia, Canada? Also wondering if there’s a way for us to measure change ourselves, in our son’s teeth after making dietary changes? Or is there a way we can ask our current dentist to monitor and assess these changes? Is there anything a functional orthodontist would do (differently from the conventional braces) to address the issue of a missing lateral incisor? My 11 year old daughter is due to get a brace for this reason – her baby tooth fell out but there is no adult tooth coming through. I’m so glad you talked about children’s orthodontist and getting braces. My little granddaughter has an incorrect bite and unaligned teeth. She’s only 8 years old but smaller than of her same age. We don’t want her to grow with crooked teeth! My 10 year old child’s orthodontist is recommending a palatal expander. An x-ray was done that showed small airway of 47%, and I was told it should be 100%. Do you recommend that we should proceed with this process of widening the upper palate? My son is turning seven next month and I wasn’t aware that this is the recommended age for a child to start seeing an orthodontist. I’ll have to look around and see my options for orthodontists in the area. Hopefully, I can find the best one to put him in braces. I hope you get to have your son checked! Early treatment allow children to correct the alignment of their jaw. Getting braces will guide their teeth into their proper position as they grow older. It will also help them stop bad oral habits an a young age. I never took into account that early orthodontic treatment could actually help the permanent teeth grow in soundly. My friend has a young son, so she’s been wondering if he should get braces or not. I’ll share this article with her, so she can make an informed decision. I can already tell that my daughter is going to need orthodontic work. She has some crowding and a slight overbite. It would be great to get a better idea on when to get her started on treatment. Great explanation of the different braces that kids can get. Mine is probably going to need them soon so I’ll have to look into that. Chances are, I’ll probably go with braces at first and then a retainer after the braces. My nephew’s teeth are crooked and my sister wants to have it corrected before going back to school. It was explained here that when children have a bad bite, it will be best to go to an orthodontist to have it assessed. Furthermore, it’s recommended to go to a trusted orthodontist for quality oral care. I like your tips about getting braces! That is really nice considering my kids don’t have braces. I’ll have to consider going to the dentists!